Volunteer Application – FozzyFest 2018! The feeling of satisfaction from contributing to a volunteer-based music and arts festival. All volunteers are required to pay a $265 deposit + $25 non-refundable administration fee. There are NO exceptions for volunteers that are new to FozzyFest. Time commitment: 2 x 6 hour shifts or 1×12 hour shift (depending on the position). In general, each volunteer must work one day shift and one night shift. You must complete 12 hours of work, or your deposit will not be refunded. No Exceptions. Review the Volunteer Manual (emailed to you prior to the festival) and be familiar with your role and responsibility. Attend one mandatory job orientation on site prior to your first scheduled shift. A sign-in sheet will be used to verify your attendance and you will be provided with your swag bag at this time. Arrive 15 minutes early for every shift and be ready to participate. This means you’ll need to leave enough time to sign in for your shift at the Volunteer Centre and walk to your post, so please prepare accordingly. All volunteers must sign in and out for every shift at the Volunteer Centre (located at Bear Necessities). Please remember to do this for EVERY shift! This is how we verify that you have completed all of your shifts so we can return your deposit. The Volunteer Centre will be your hub and will have your volunteer schedules, snacks, coffee and tea, etc. It is completely unacceptable to be intoxicated while working. Volunteers must arrive for all shifts ready to work. That means you are fed, well-rested, and sober. If you arrive under the influence, or if you become under the influence during your shift, you will not be working your shift resulting in a forfeit of your deposit. Also, you will be blacklisted from volunteering with us again and possibly escorted out of the festival. Remember, you are a representative of FozzyFest whether you are on shift or not! Your behavior on and off shift affects our guests. Please treat everyone with love and respect, come without judgment, and with an open heart. 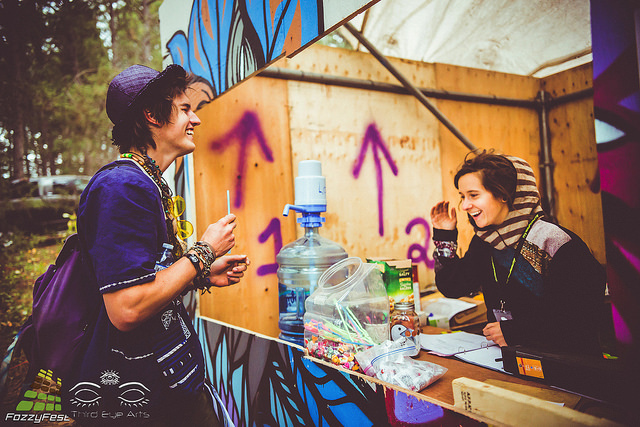 Front Gate: You will be the gatekeeper of the Festival. ROVERS: Respect, Observation, Vigilance, Environment, Responsibility, Safety: You will be moving throughout the campground in an orderly rotation, observing guests, doing ground maintenance, and assisting where needed. Parking: Regulate the direction and flow of traffic, park vehicles in an orderly fashion. Bear Necessities/Volunteer Centre: Work at the FozzyFest headquarters. Assist with all tasks, including selling of merchandise, check-in and check-out of volunteers, and provide general information. Kitchen: Kitchen volunteers are scheduled for three 4-hour shifts instead of two 6-hour shifts like other positions. Help prepare and serve Crew meals and assist with clean up. MUST have commercial kitchen experience. Teardown/Cleanup: Must be available on Sunday/Monday or Monday/Tuesday, after the Festival. No exceptions. Please note that FozzyFest hires third parties for First Aid and Security, accordingly, we are not looking for volunteers for these positions, though we will gladly use your experience in other roles. If you are interested in applying for a Sanctuary position, please do so by emailing sanctuary@fozzyfest.com directly for more information and instructions. Applications will go live on February 1, 2018. If you would like to secure your spot as a volunteer with FozzyFest, please follow the link below to our Showpass “event”. You will be asked to pay your deposit and non-refundable admin fee and once paid, you will receive an email with a link to our application. You may note that the Showpass “event” is scheduled to take place on October 6, 2018…do not be alarmed! In order to efficiently refund the deposits we had to create this dummy event with a date later than the festival date.